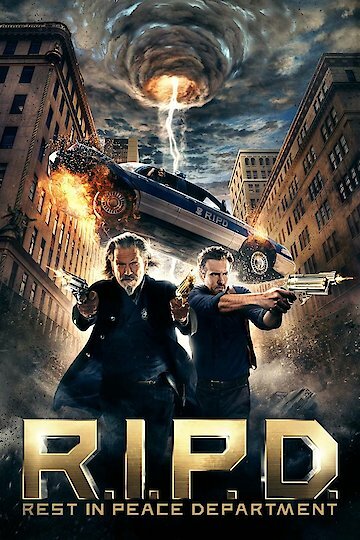 "To protect and serve the living"
R.I.P.D is a supernatural comedy film that is based on a comic book story. Boston Police Detectives Walker and Hayes steal a chest full of gold. They found it while making a drug bust and Nick looks to bury his share in his backyard to secure the financial future of his family. However he realizes that he did something unethical and therefore decides to return the gold. Walker and Hayes perform a raid on a warehouse and get into a gun battle with some criminals. During the shootout, Hayes murders Walker so that he cannot return the gold. Hayes also frames the criminals for the murder as well. Shortly after his death, Walker ascends to the sky of the afterlife. He is taken to the office of Mildred Proctor who is in charge of the Rest In Peace Department division. This agency recruits dead police officers. With this department, they recruit officers to capture Deados who are spirits of individuals who failed to pass through and return to Earth as ghosts. Walker agrees to join the R.I.P.D and partner up with Roy Pulsipher who was a US Marshall during the 19th century. This assignment would be intended to avoid a negative judgment for at least 100 more years. Walker and Pulsipher then return to Earth and attend a funeral. After the funeral they begin their assignment of tracking down Hayes to retrieve the gold and bring him and the Deados to justice. Once on their assignment they go to various places in order to track down Hayes and anyone of the Deados. During this time they eventually find gold that Hayes had and retrieve it. However this task infuriates Mildred Proctor and both Walker and Hayes are taken off the assignment. Despite being suspended from duty, they continue their operation in order to get back at Hayes and his fellow Deados. Walker and Pulsipher eventually have a standoff with Hayes and the Deados. R.I.P.D. is currently available to watch and stream, buy on demand at Vudu, Google Play, FandangoNow, iTunes, YouTube VOD online. Ryan Reynolds and Mary-Louise Parker have the unenviable distinction of being, between them, in all three of the new releases that under performed at the box office last weekend. Reynolds' bad luck is especially keen, since he had a lead role in the week's biggest bomb. It's been a bumpy summer for movie studios so far. After a start that put the season on a pace to break records for box office receipts, a series of disappointing box-office performances by big-budget releases has shown that no one can predict with any real accuracy how the summer is going to end up. View More News for R.I.P.D.